Home > Daily/Frequent Painters > Alessandro Andreuccetti > Alessandro Andreuccetti: Human Angels or Angelic Humans? 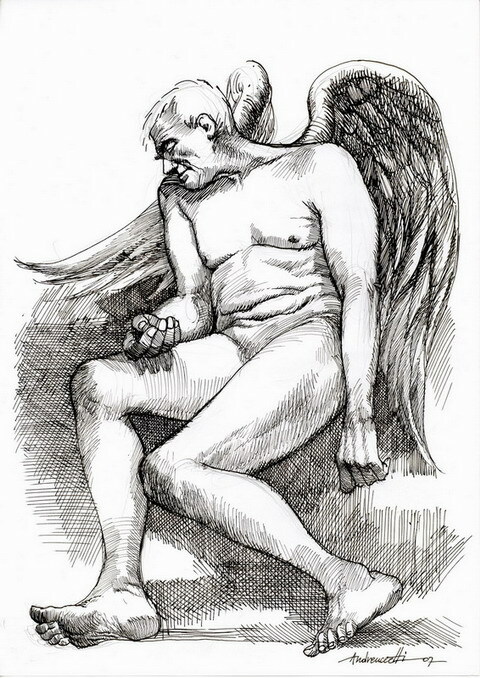 Alessandro Andreuccetti: Human Angels or Angelic Humans? These drawings are a part of a fascinating series of nudes presented as angels. Actually, some of the depicted models do not possess wings, but the effortless synthesis of this characteristic divine feature with the human body where they do, causes the viewer to overlook this shortage when they don’t. In other words, the idea of the accretion becomes ingrained in our mind, and continues to affect our perception throughout the series. 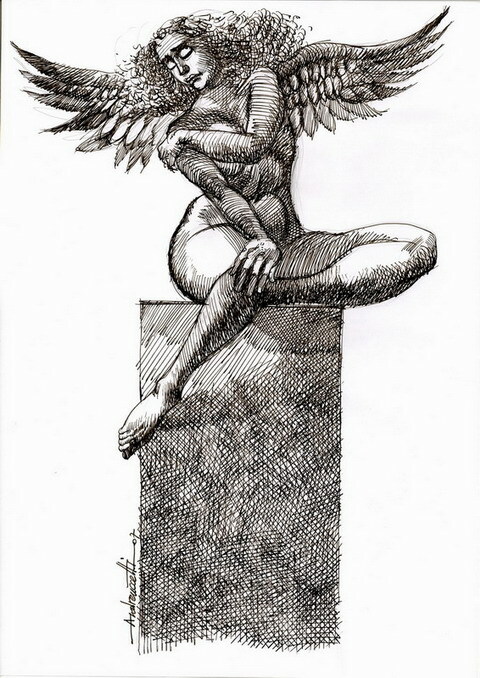 So powerful is this idea, that some notable effort is required to notice that the wings are missing; and after that, the drawing may seem deceptively incomplete. It’s as if the artist induces an unintentional optical illusion. He is unsparing in his choice of models and representation (physical defects in the form of folds of fat), but often incorporates dancelike motifs into the poses: the first step towards grace that redeems the defects, the second being the wings. Though at the first glance they may seem like an alien addition, even a farcical ridicule (in comparison with the traditional cherubs — gleeful, giddy children), I strongly tend towards the more compassionate and humanistic interpretation that the artist wanted to reveal the saintly side of the subjects. Perhaps they are seeking some sort of deliverance, or have already found it; either way, here the notion of sainthood and humanity becomes inseparable, and slightly awe-inspiring. But that is not to say that there is no humor, or self-referential irony in these sketches. I think that there is something very releasing in the freedom and ease with which the artist depicts physical imperfections — and that this is exactly what the models “are feeling.” They generally exhibit resignation and acceptance — suffering maybe — but not rebellion or resistance. They appear aware but irreverent of their flaws, which hence cease being flaws: probably the best known way to accumulate charisma and deliver its joyous effects to the beholder. The other funny streak is the formal technical resemblance to caricature. In some pieces, the genres intersect quite often, and eventually even the practice of discerning which is which becomes ironic. Finally, I would like to dwell on the theatrical element that transpires from the series, in various degrees. The subjects are usually positioned against an abstract background, sometimes a wall, or placed upon a pedestal. Had we combined this feature with the graceful movements, particularly of the legs, with the wings as props and with the expressive, dramatic gestures, a general suspicion would arise that we have been transported behind the scenes of a strange theater. Thus, the backstage would become the unifying concept behind the series. In turn, the sketch-book might reemerge as a monograph describing the venue and the actors — while this review could be seen as the accompanying text.